This mod aims to improve vanilla banners by adding new patterns. These patterns are based on existing items in the game and are perfect for adding extra immersion to your Minecraft world. The mod currently features 44+ new designs! For images, screenshots, and documentation, check out the images section of this project page! Q: Why does the shield pattern use a door? A: The shield can already be crafted with banners, meaning they can not be used as a pattern ingredient. Historically doors have been used as a stand in for shields before shields were added and I don't think a door pattern would make sense. It felt like a good fit for those reasons. Q: The banner pattern wont craft, what gives? A: Some of the patterns use items with variations, such as armor and tools. Banner patterns can only use the main version of an item, so if the tool or armor is damaged it wont work. Banner patterns also can not support ore dictionary entries, so it must be the exact item. Q: Can I put any item in the game on a banner? A: While that would be cool, the banner system isn't very flexible. All the patterns are created by hand, and it will not be possible for users to add their own designs using this mod. Q: Will this work on servers? A: Yes, this mod will work on servers. Make sure the server has the mod installed as well. All players connecting to the server will need this mod. Q: What happens if I uninstall this mod, but have banners with these patterns? A: The modded pattern will become invisible. It will still be on the banner, but it will basically not exist. The banner patterns will be restored if you ever install the mod again. The banner in the logo of the mod is unfortunately not available. It's a photoshop effect. Could you make an item that looks like the logo banner but you just can't put patterns on it? Playing 1.12.2, and I can't figure out the crafting recipe for the Cthulhu looking squid one. Is there an official list of recipes somewhere? Edit: also looking for the smiley face one, because who doesn't want a happy Cthulhu banner? Hey there, there used to be a bunch of images showing the recipes but took it down a few days ago as I am rewriting the post for 1.13.2. The 1.13.2 update fixes a bunch of the colors so the old screenshots no longer accurately represent what the mod looks like. The Cthulhu/Kraken/Squid pattern uses a prismarine shard. I don't have a happy face pattern in the mod so not sure what that one would be. If you have JEI installed you can lookup all recipes for banners which should help you find what you're looking for. When i try to look at the recipes with JEI it just shows how to craft a banner, not sure what's going on there. Oh well, i'll just give it a pumpkin face. Thanks man! 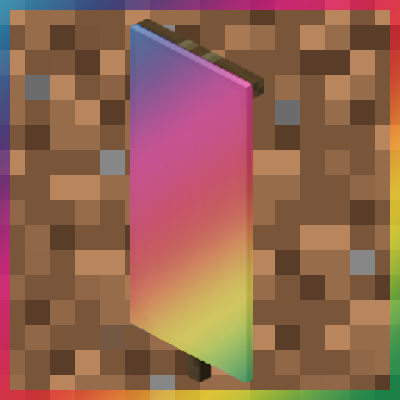 When Forge comes out for 1.14, are you going to update the textures to match? I am not sure yet. Since most of these textures are silhouettes there isn't much to change. Depending on when Forge for 1.13 comes out, I may explore porting this to Fabric 1.14 snapshots first. Is there a Sphax addition for this mod? When ever I use this mod and create a banner my game lags to death. This mod just adds new textures to the vanilla banners, it doesn't do anything with the crafting, rendering, or logic. Im sorry. My games lag may not be your mod but just Minecraft messing up on me. Currently it won't take me out of spectator mode. Wondering if actual quadrants can be used as patterns, or if that can't be done due to limitations of the banner system? Would be quite nice. Does this mod have compatibility with Quark? Quark has two new banner patterns, one created using an Iron Sword, the other with an Iron Chestplate. I'd like to keep this mod's patterns as well as Quark's patterns. Should I contact Vazkii about adding compatibility? I don't see why they would be incompatible. Only issue would be if two of the patterns use the same items, but I use the gold sword and chestplate for my recipes. They are compatible since Quark uses iron and AB uses gold. This isn't working on 1.12.2. I put an iron pickaxe in the center then the banner on the right and i get nothing at all. Did you also put a dye in with the pick? You need to put a banner, a pattern item, and a dye item in for it to work.